As part of the agreement with one of our Major Corporate Partners, Blackboard Inc (Bb), HETS had the opportunity to extend the collaboration to Higher Education Institution which attended the Bb Forum on February 29, 2012 in Puebla, Mexico. 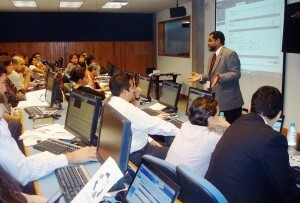 More than 90 faculty members and representatives from the following institutions and organizations : Benemerita Universidad Autónoma de Puebla, Educación Superior de Celaya A.C, Fundación Universidad de las Américas de Puebla, ITAT, Sistema Tecnológico de Monterrey, Sistemas CBT, Colegio de Estudios de Posgrado de la Cuidad de México, Centro de Investigaciones y Estudios de la Salud, OCC Mundial, Universidad del Valle de México, Universidad del Istmo, Universidad Iberoamericana Puebla, Universidad Estatal a Distancia (UNED), Universidad Anáhuac México Norte, Universidad Autónoma del Estado de Hidalgo (UAEH), Universidad Pedagógica Nacional, Universidad Politécnica de San Luis Potosí, Universidad Popular Autónoma del Estado de Puebla, Universidad Virtual en Ciencias de la Salud, Athenea- Global Network Technologies, Consutoría en Redes, Contaduría República BUAP and Soluciones 4G took advantage of two workshop sessions conducted by two HETS Experts. HETS has been recognized for its commitment to achieve excellence in Higher Education, especially among the Hispanic community. Through this collaborative agreement with Bb, HETS have been able to reach international audiences not only in Mexico, but also at Bb Forums in several cities in Colombia. HETS is constantly looking for fresh ideas in its field of expertise to bring its members the best of all services, and maximize the knowledge and experiences of member themselves, as they get together to collaborate with each other and contribute to one another. A new initiative for the benefit of everyone is the availability of our Professional workshops completely online. Anyone can take full advantage of these workshops since they are conducted online, are also accessible from almost everywhere anytime. Please visit the following link to learn more about our online workshops and register online: HETS Online Workshops.